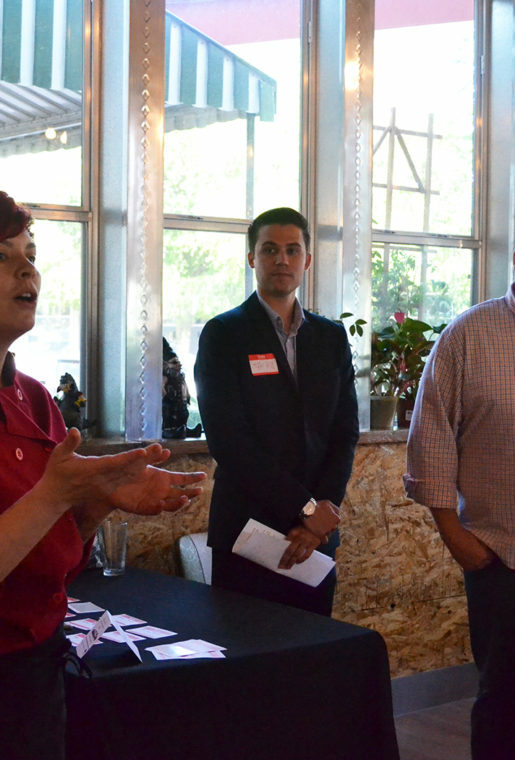 Left to right, Chef Suki Otsuki, Tyler Hill from Ford’s Dallas Regional Office , and Robert Beaird. 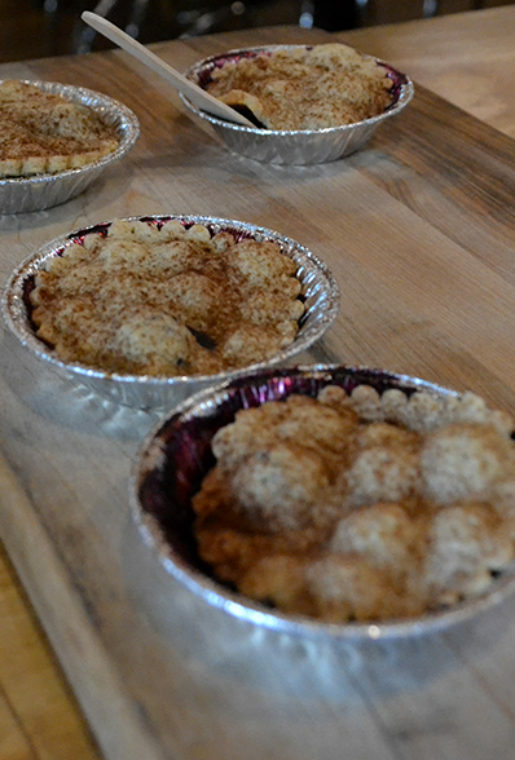 A few of the inspired eats served during the event. 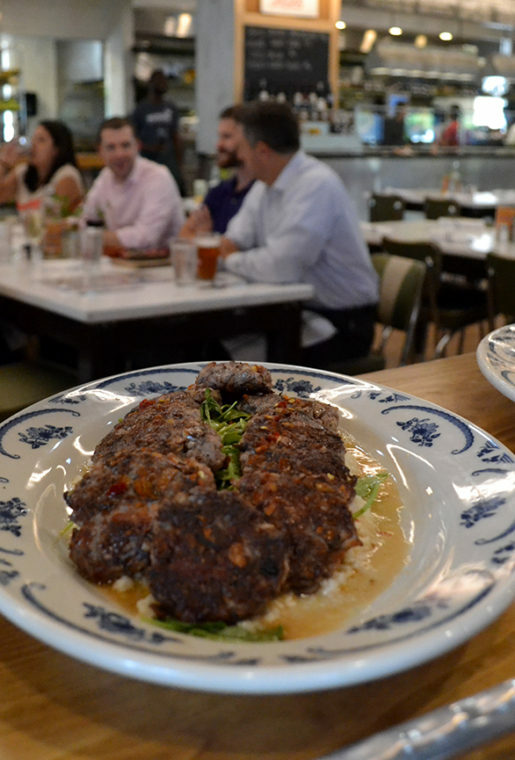 Loco Moco beef sliders with coconut cauliflower rice and pickled shrimp cucumber canapes. 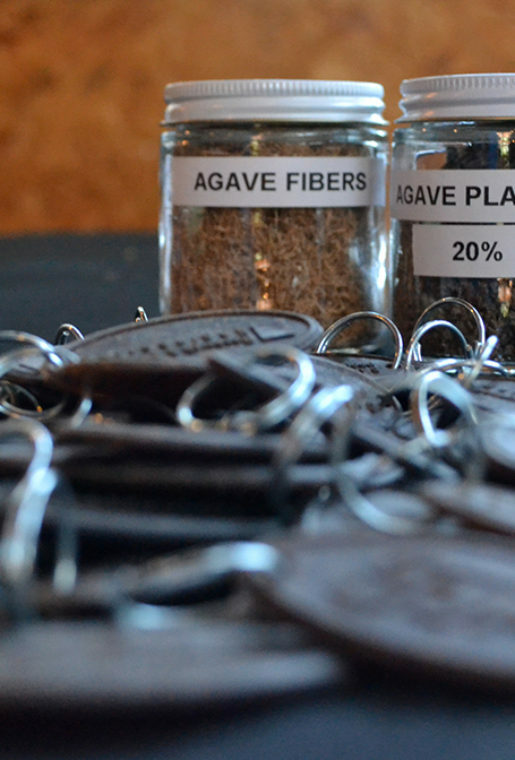 Ford recently announced their partnership with Jose Cuervo which will explore the usage of the agave plant to create more sustainable bioplastics for use in Ford vehicles. Tomato fibers are also used in Ford’s car producion. The day that tomato skins are made into storage bins is finally here thanks to Ford Motors. 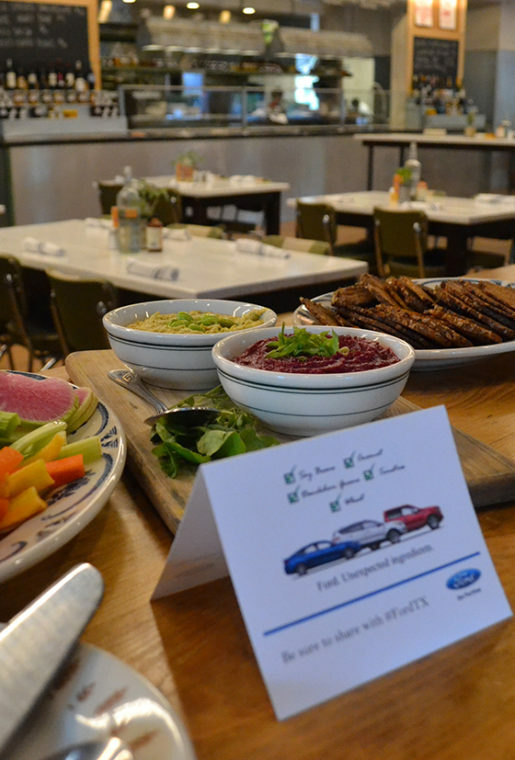 This past Wednesday the popular car company hosted a unique happy hour, with menu items highlighting many of the sustainable materials used throughout their lineup of vehicles. 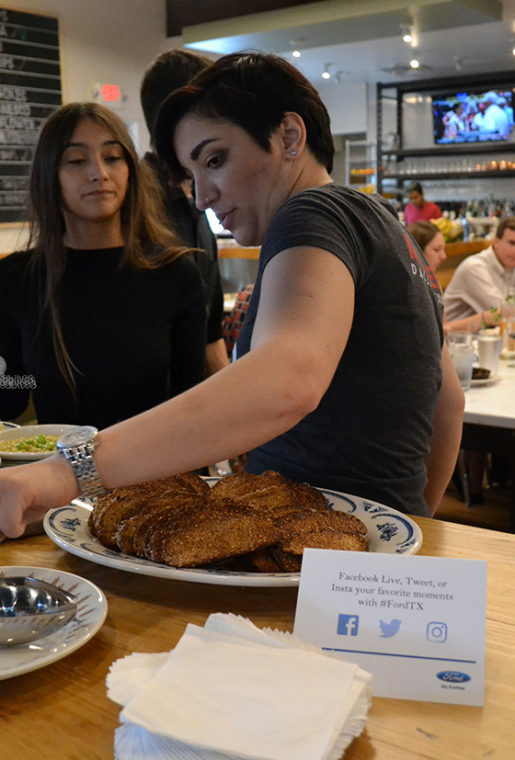 Hosted at the organic Mudhen Meat and Greens, it only made sense that Chef Suki Otsuki be tapped to craft the special menu. 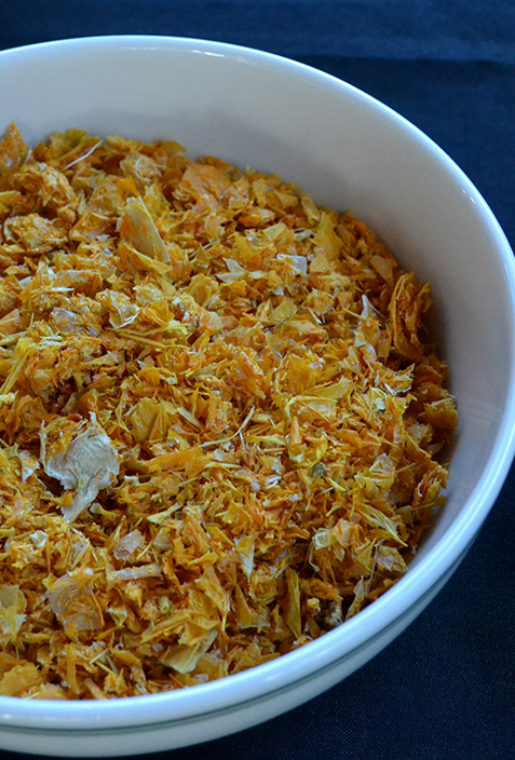 Items featured during the mixer were made with soy beans, coconut, wheat, tomatoes and dandelion greens, all of which help in creating different parts Ford vehicles. For example, dandelion greens are currently being researched as a more sustainable resource for rubber that could potentially be used for interior trim, plastic cup holders, and floor mats. The evening began with wine, beer, and two craft cocktails prepared for the occasion. The Watermelon Cooler, made with Tito’s Vodka, lime juice, club soda and agave was summer fun in a few sips. Agave was used in the cocktail to highlight a new partnership between Jose Cuervo and Ford that will turn agave waste from tequila into bioplastic for cars, which is less damaging than materials made from petroleum based products. Bites prepared by Otsuki included the dip duo platter, consisting of edamame hummus, and beet muhummara served with extra crispy Mockingbird crostini’s. 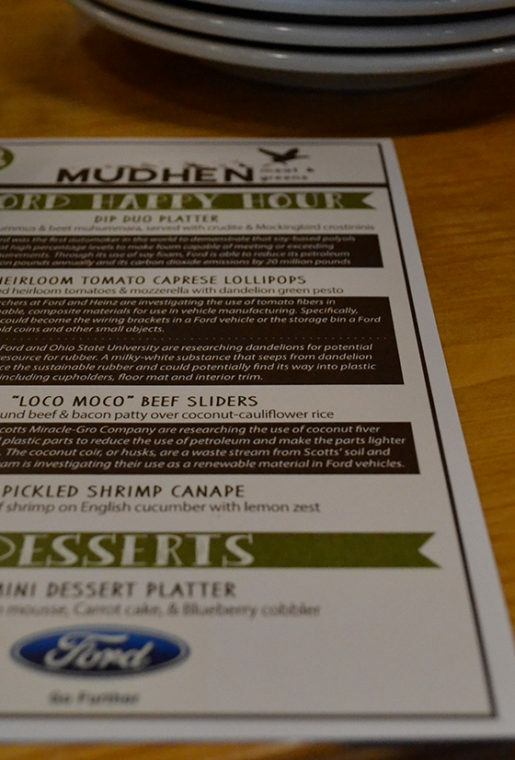 My favorites were Otsuki’s heirloom tomato caprese lollipops paired with soft mozzarella and dandelion green pesto, and the “Loco Moco” Beef Sliders made with house ground beef and bacon over coconut cauliflower rice. For dessert we had our pick of Chocovocado mousse, carrot cake or blueberry cobbler. Having never met a blueberry I didn’t love, I went straight for the cobbler. The crust lacked that certain buttery richness that I’m used to, but the blueberry filling maintained a polite semi-sweetness.